Earlier this month we reported on an investigation into the story of Father Crespi and his missing artifacts. The story of Father Crespi is a mysterious and controversial account of a priest in Ecuador involving claims of unknown civilizations, strange golden artifacts, a subterranean cave system containing a metallic library, depictions of figures connecting America to Sumeria, symbols depicting an unknown language, and a Vatican conspiracy involving thousands of missing artifacts. Ancient Origins undertook an investigation to find out how much of the story is true. While our initial enquiries produced valuable information, our latest explorations resulted in threats and a warning to stop pursuing further investigations into the missing artifacts. If you have not yet read the first article, please read it here before proceeding with this update. Father Crespi’s collection is not missing but was purchased by the Central Bank of Ecuador and is currently stored in their museum vaults. The majority of Crespi’s collection consists of authentic and valuable artifacts gathered from around Ecuador. The so-called Metallic Library mentioned by Eric von Däniken in his controversial book ‘The Gold of the Gods’ is nothing more than modern-day carvings on cheap metal. A small subset of artifacts, which were photographed and filmed in the 1970s, consisting of gold carvings, hieroglyphs and Sumerian figures is genuinely missing and no one seems to have the answers as to where they are located and what their significance is. On Wednesday the 30th March, Dr Ioannis Syrigos, Co-Founder of Ancient Origins, arranged an appointment with Dr Luis Alvarez, expert on Father Crespi and Editor General of the Universidad Politécnica Salesiana (a University founded by Father Crespi), to clarify a few missing pieces to the Crespi puzzle for a video Ancient Origin’s is preparing about Father Crespi’s life. This is an important video that will present the great personality of Father Crespi and his immense help to the people of Cuenca, Ecuador. 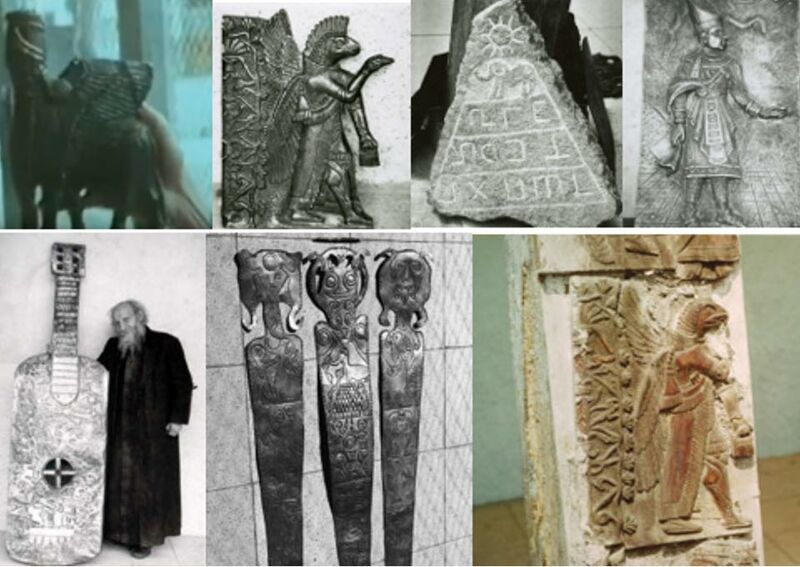 The missing pieces of the puzzle are of course the golden artifacts depicting hieroglpyhs and Sumerian figures, the ones that Crespi presents and supports in his videos with Stanley Hall and the ones that Professor Barry Fell of Harvard University identified as original. Some of these artifacts can be seen in the video below. The missing artifacts consist not only of metallic (golden) tablets, but also clay and stone artifacts with unusual carvings, none of which were among the thousands of artifacts that we viewed in his collection held by the Central Bank of Ecuador. Some of the artifacts were accepted by Father Crespi as original and authentic, while others were fake, which he also knew and acknowledged. As a highly educated man – a scientist, educator, anthropologist, botanist, artist, explorer, cinematographer, humanitarian and musician – Father Crespi was in a good position to assess the authenticity of the artifacts. After our arrival at the University, we met with Dr Luis Alvarez, who as always was friendly and welcoming, eager to help us complete our research and the video about Father Crespi. In our discussion, we explained the importance of having all the facts around Crespi clear in the video, otherwise the video would be incomplete. However, any reference to the missing artifacts made Dr Alvarez uncomfortable. Initially it seemed that this was because he preferred that we focus on the other aspects of Father Crespi’s life that he deemed more important than the artifacts – i.e. his charitable endeavours. However, later it appeared that there were other reasons he was uncomfortable discussing the artifacts. The official response of Dr Alvarez was that these artifacts simply went missing, never to be found again. His assistant kindly clarified that 2 years before the death of Father Crespi, all items in his collection were recorded apart from the missing artifacts, which according to her, were already gone by then. While initially Dr Alvarez said he knew nothing about the location of the missing artifacts, later on he contradicted this statement by saying that he was not authorized to talk about them, suggesting that it was not that he did not know, but that he was not permitted to reveal anything about them and was withholding information.